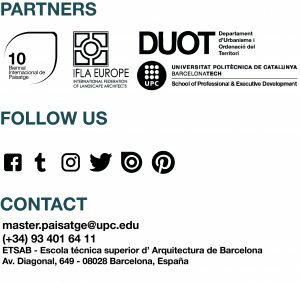 INTERNATIONAL WORKSHOP III: Fertile grounds emergent ecologies and commons – Master in Landscape Architecture Barcelona – Universitat Politècnica de Catalunya – 35ª EDITION. In the search for new fertile grounds in the urban fabric, the Intensive International Workshop will focus on strategies of landscape osmosis and revitalization. The workshop is aiming for ‘new fertilities’, both in a conceptual and in a literal meaning, in order to insert landscape values and social interaction in post-industrial environments or in urban environments in transformation. Having as an initial and experimental purpose to redefine the borders between the urban and the natural, the workshop will investigate sustainable solutions for livable human ecosystems. Landscape design as a philosophy of urban transformation is able to reconnect and act as a creative mediator for the community’s expressions. How can the landscape project—with ecology and commons as design tools—reinforce the identity of a neighborhood? Is a landscaped public space a fertile canvas for human social performances and actions? Could new centralities be ‘seeded’ by cultivating urbanity and commons in post-industrial or peripheral districts? Through the design of intermediate natures as infiltrating systems, the workshop aims to reveal opportunities for landscape connections and community networking in the neighbourhood of Poblenou. By re-connecting people, nature and fabrics, the landscape design project—with ecological emphasis and goals—can become a catalyzer for improving livability and for recovering/reimagining the district’s sense of place.